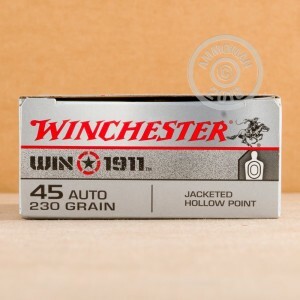 This .45 ACP ammunition from Winchester is optimized for the classic 1911 pistol. It fires a 230 grain jacketed hollow point bullet at 880 feet per second, delivering the same ballistics as the corresponding "WIN 1911" FMJ load. 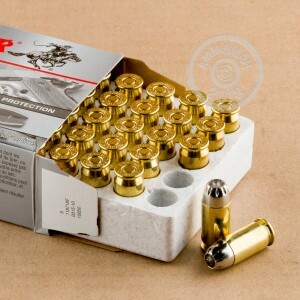 These cartridges come in convenient boxes of 50 and use non-corrosive Boxer primers and brass cases. 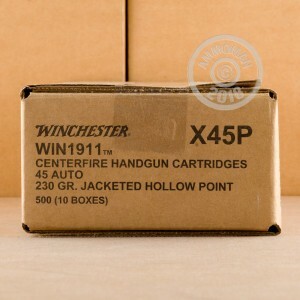 Like other Winchester ammo, they are manufactured in Oxford, Mississippi. Serious shooters have been coming to AmmoMan.com for over a decade to stock up. With free shipping for all orders over $99, they've saved some serious money! Im very happy to say this is an all around grate round.Range or home protection this ammo meets the street in my book!! !